Hi there! 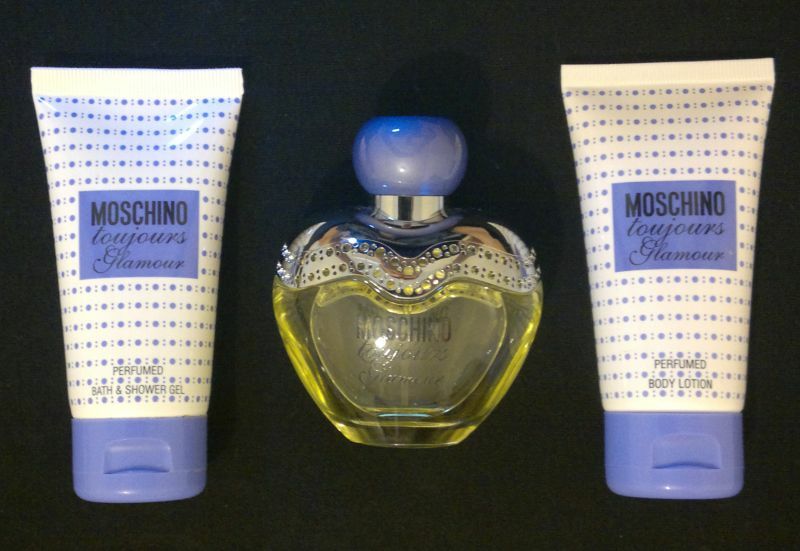 Today’s review is about Moschino Toujours Glamour Eau De Toilette, Perfumed Bath & Shower Gel and Perfumed Body Lotion. I never really cared for Moschino fragrances. However, Moschino’s Toujours Glamour gift set looked quite appealing – in part because it was half price. So… I bought it! OK, let’s take a closer look at the fragrance! Moschino Toujours Glamour is described as a light floral fragrance. The fragrance notes are red currant, green violet leaves and cardamom (top notes), lily-of-the-valley, jasmine and bitter almond (heart notes), and heliotrope, benzoin and musk (base notes). Now onto the actual product reviews! And what’s the actual fragrance like? I think Moschino Toujours Glamour Eau De Toilette is a nice enough fragrance. It’s light, it’s floral, it’s powdery, it’s inoffensive, and it’s perfectly forgettable. I think Toujours Glamour would fit in with all these random ‘suitable for office wear’ fragrances that everyone kind of likes but that no one really remembers. Well, I will use up the shower gel and the body lotion, and I’ll probably continue to use the fragrance on and off for a few weeks before I’ll pass it on to a young relative who, without doubt, will enjoy it much more!